The Peavey Grind 5-string solidbody bass gives you boutique quality at a rock bottom price. Peavey Grind basses feature a neck-through-body design, are crafted of mahogany with maple stringers, and sport a fast mahogany neck with an Indonesian rosewood fingerboard. The result is smooth playability, impressive sustain, and gutsy, resonant tone. Bass Player Magazine gave the Grind their distinguished Editor's Award, so you know Peavey's onto something. 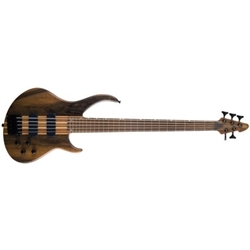 In the market for a great-sounding (and playing) bass that won't break the bank? You owe it to yourself to give the Peavey Grind a serious audition. Grind out the Low End, with the Peavey Grind solidbody bass!